Pancake day is just around the corner and we can’t wait! Whether you enjoy them sweet or savoury, we’ve got all the toppings and recipes that you’ll need this Shrove Tuesday. 1. Sift the flour with a pinch of salt into a large bowl and then make a well in the centre. Pour the beaten egg in and slowly whisk in the milk until you have a smooth batter. 2. Heat a pan with some oil over a medium heat. 3. Add a ladleful of batter into the pan and use the bottom of the ladle to swirl the batter into an even circle. 4. Cook for a few minutes until the underneath is golden, flip and repeat! 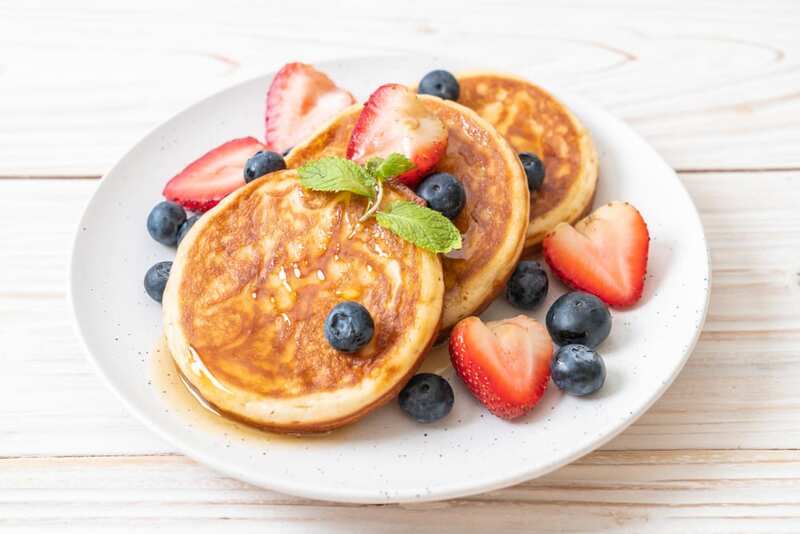 Our favourite way of enjoying pancakes is when they’re topped with raspberries, blueberries and strawberries! All of which are available for just £5 in our Berry Bundle! 1. Sieve the flour, baking powder and a pinch of salt into a large bowl. In a separate bowl, mash the bananas with a fork and whisk in the eggs, vanilla extract and milk. 2. Make a well within the centre and tip in the wet ingredients, whisking until you have a smooth, silky batter. 3. Heat some butter in a pan over a medium heat, add 2-3 tbsp of batter into the pan and cook for 1-2 minutes on each side. 4. 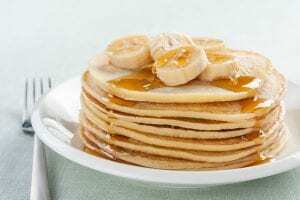 Stack the pancakes and serve with banana slices and some sticky maple syrup! Delicious! 1. Put the flour, cornmeal, baking powder, milk and two of the eggs in a food processor and mix together. Add the sweetcorn and coriander and pulse until all the ingredients are combined. 2. Fry the peppers and chorizo in a pan until the peppers are soft and the chorizo’s oils have leaked into the pan. Stir in the salsa and tip into a bowl, set on the side. 3. Wipe out the pan and reheat with half the oil. Add dollops of the pancake mixture into the pan. Cook each until the underside is golden and then flip. 4. Add the remaining oil and continue cooking. You should be able to make six pancakes in total with the mixture. 5. 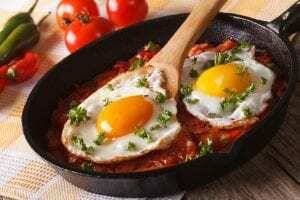 Serve the pancakes with the chorizo salsa and fried eggs. We also recommend scattering coriander leaves over the top for a delicious final touch! 1. 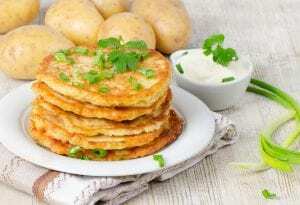 Cook your potatoes in boiling water until they are tender. Once drained, mash them and weigh out 250g. 2. Sieve the flour and baking powder onto the cooled mash. Whisk together the eggs and milk and then add it to the potato mix. Whisk again, until the batter is smooth. 3. Heat ½ tsp of sunflower oil and a dot of butter in a frying pan. Add 1 tbsp of batter for each pancake, cooking four at a time. 4. Cook for one minute until small bubbles appear and the underside is golden brown. Flip the pancakes and repeat. 5. We recommend serving the pancakes with scrambled eggs and even a rasher of crispy bacon!